Most of the tips I have for soundproofing doors work under the assumption that you’ll be keeping them closed. However, many people don’t close their doors at all, opting to allow air to move through their whole home. Well, that can result in something that’s a fairly annoying occurrence, in my opinion: the doors can slam shut because of the draft. Fortunately, there are plenty of ways to prevent doors from slamming and many devices and products that can get the job done. So if your doors often slam shut too easily, you’re going to want to hear what I have to say. Not only am I going to review several different products that can help you, but I’m also going to tell you exactly how you can make them yourself — often for free! But first, let’s discuss why someone would need these devices and which general categories exist. Many of these brands make silencing closing doors the priority. But although those of us who are bothered by noise will find this a great reason to buy one of these products, many people aren’t actively looking for that. Instead, many people get door slamming preventers to protect their kids’ fingers. As you may be aware, toddlers love playing around doors, opening and shutting them. So many of the products on my list also make it impossible for a door to completely close, leaving a bit of space between it and the frame. Lastly, some of these products also make it impossible for people to lock themselves out of their room or apartment. Now, before I go into product reviews, I usually like to list some of the basic features you should look for when shopping. However, this time, the items on my list don’t really have special features. Instead, I’d like to talk about the general types of products I’ll be mentioning and explain how they work. I’ve taken the liberty of dividing the types of products on my list by their placement. Some of the items I’ll review can stick to the inside of the door, where it meets the frame when you close it. Although that does provide the cushioning you want, it doesn’t quite eliminate the possibility of the door being slammed. In order to completely prevent the door from slamming, you should aim to get one of the products that will prevent it from even closing. Don’t worry — most of them are removable. But while they’re on the edge of the door, they’ll keep some space between it and the frame. You can either place them on top or on the side where the knob is. Speaking of knobs, there are also products that you can attach to the knob on each side of the door. They cover the latch bolt so that you can’t get locked out of your place. Although they’re often soft and thick enough to make a difference, they won’t stop the door before it hits the frame. You can also put in a temporary slam guard on the door hinge — so on the opposite side of the door from the knob. I’ll demonstrate this a bit better when I review the product I’ve selected. 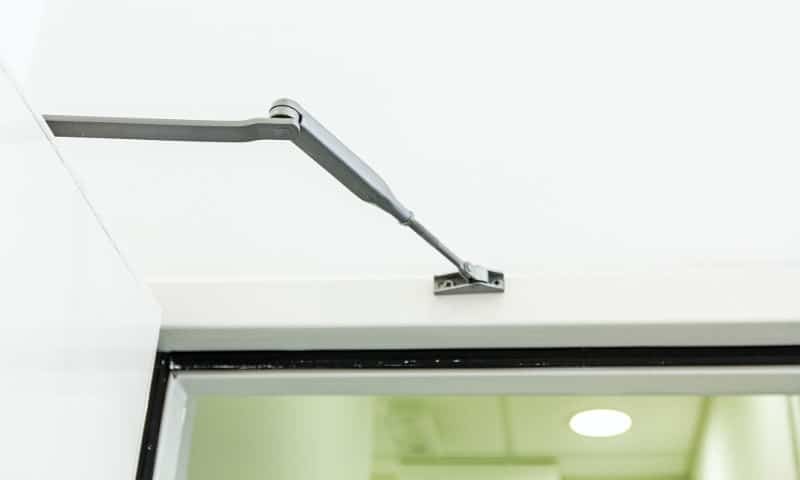 Lastly, you could also install a mechanism above the door with a jointed arm that holds the door and softly closes it before it can slam shut. This device is actually very affordable, so I’ve also decided to show you how it works. This time around, I’m going to present my reviews going from the simpler products to the more complicated designs. So let’s see the best door slam preventers I’ve chosen to feature. The first product on my list is very simple, but it’s also pretty effective. The HushBumps Ultra Quiet Bumpers may look like anti-slip stickers, but they’re far from it. While anti-slip products are usually made of rubber, these 1.18 by 0.23-inch rectangles are actually filled with a polymer gel. The item I’ve linked to contains 30 of these rectangular pieces, so you’ll be able to attach them to several doors. The pieces are only 0.09 inches thick, but they’ll provide just enough padding to absorb the shock of the door closing. What’s more, the really great thing about this product is that you won’t need to remove it when you want to close the door. Unlike the previous product, this one won’t allow the door to close while it’s on. The Wittle Finger Pinch Guard will actually create about an inch and a half of space between the door and the frame. If the name of the product wasn’t a huge tip-off — this is one of the items that primarily serves to protect fingers from getting caught. Still, in my opinion, this is one of the most effective cheap solutions for preventing slamming doors. You get 4 pinch guards in a pack that you can place along the side of the door or on the top edge. When you want to close the door, you can hang the C-shaped foam bumper on the knob. The product I’ve linked to is fairly standard — you can find similar white bumpers elsewhere. Additionally, there are even ones with fun designs, like the ones from JamHooDirect Stopper. Those come in 7-piece sets wherein each piece represents a different animal. Still, these things aren’t toys, so make sure to keep them out of reach (or prepare to have them mysteriously disappear if you have kids). The Happy Hands Safety Finger Stoppers have a similar function to the previous product, in that they leave some space between the door and the door frame. However, unlike the foam bumpers, these hand-shaped door stoppers are made of hard plastic. The manufacturer promises that they’re better than the foam stops, and the users seem to agree. This product has a flat back that adheres to the edge of the door and a little hand that rotates out to stop the door. When you’re not using it or when you want to close the door, you can also flip it up. In addition, you can buy this in one of 6 fun and vibrant colors, so you can use them in the nursery as well. 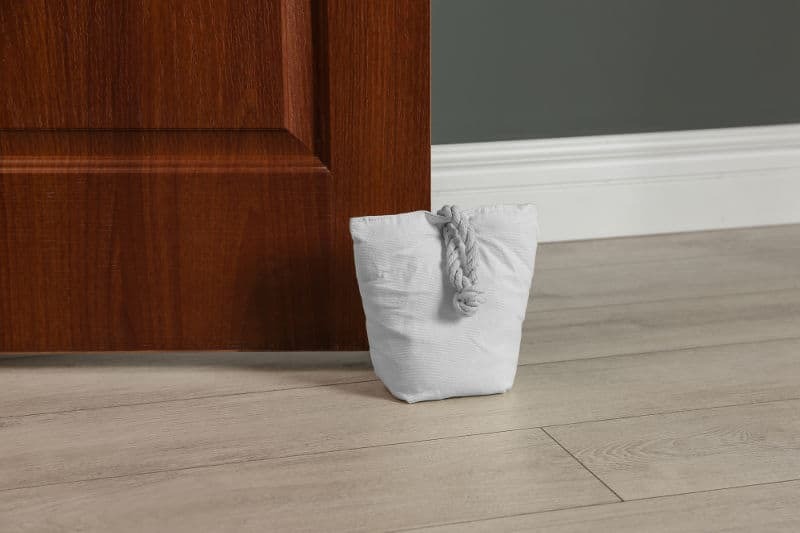 The Cushy Closer Door Cushion is a small, stuffed fabric rectangle that has two elastic loops on the shorter sides. Basically, you’re meant to loop one of the elastics around the doorknob and stretch the 5.5-inch long rectangle around to loop the second elastic around the knob on the other side. The fabric rectangle is 3.5 inches wide, which means that it’s going to press the door latch down. As you can imagine, this product is primarily made to stop doors from closing or locking. Then, when you actually want to lock the door, you can remove one of the elastic loops and leave the cushion hanging off the knob on one side. According to the manufacturer, aside from being able to silently enter the room where your child may be sleeping, the padding will also prevent rattling and slamming. This manufacturer offers 13 fabric colors (including a particularly charming fox pattern). However, if you’d like some more options, you can check out the Latchy Catchy selection. And I’ll also tell you how you can make this yourself after the reviews. Unlike the previous products, which you can attach to the edge of the door where the knob is, the Rhoost Finger Guard is meant to be hooked onto the door hinges. Depending on the direction your door is facing, this product will either stop it from closing or prevent it from opening. Either way, it will keep the side of the door with hinges open and protect your kids if they push their fingers into that gap. This finger guard is made of white PVC. The way it looks is a bit hard to describe, so you’ll just have to see it in action. Essentially, it has a hook that goes over the hinge and an angled bit that holds the door open. But, again, you’ll need to use your better judgment when determining whether your door needs a product like this or not. This Automatic Door Closer from the Fortstrong Hardware Company was particularly interesting to me, especially because I couldn’t believe that it was so cheap. I’ve been going through life believing that the slow-closing mechanisms most stores have are expensive! All the while, I could have had one of these things in my home. The product comes with all of the pieces you’ll need to assemble it, and they’ve even made a helpful installation tutorial video you can find online. There are several ways to go about installing it, so I recommend checking it out. This product is also adjustable in two ways. Using a regular flat-head screwdriver, you can turn the two valves on the side of the box to tinker with the closing and latching speeds. The first speed is how quickly your door will get to 15 degrees, while the other is the speed at which it will close entirely. Draft stoppers are another item you could use to prevent your doors from slamming. As their name suggests, they’re primarily meant to prevent air from passing through the bottom gap of your doors. Naturally, where there’s air, there’s noise — which means that draft stoppers are right up my alley. I’ve written all about them and a few other ways to close the bottom gap of your doors in my reviews of soundproof door sweeps (link below). Draft stoppers can be single tubes you place on one side of the door or double ones that slide underneath the door. In my opinion, both of these would work just fine. However, if your main concern is preventing the door from slamming shut, the single tube version might be preferable. Personally, I prefer draft stoppers that are weighted with ground stone, like this one from Thermwell. There are cuter versions of this product, such as this pink unicorn-shaped one or one of the many animal-shaped ones from Evelots. But if you end up getting a double draft stopper like this one, you should probably remove the foam inserts. You need some weight to prevent the door from slamming, so I recommend gluing down one end of the tube, filling it with rice or gravel, and then closing the other end as well. Or, you can even make your own draft stopper from scratch. Of course, there are also ways to make each of these types of slam preventers by yourself. I haven’t given much thought to building a door slam prevention mechanism, but I can give you three ideas. I’ve already explained how to make a draft stopper in a previous article. Still, I’ll give you the cliff notes version. You can choose any piece of fabric, as long as it’s approximately as long as the door is wide. Even an old pair of pants would work — and you’d be able to make two draft stoppers out of them. You can sew or even glue the two pieces together front to front. Once you’ve done that, you can invert them, to keep the hems invisible. That should basically give you a long tube pillowcase. At this point, you can fill it up with rice or gravel as it is. However, you can also glue it down the middle from the inside. The second option would result in the type of draft stopper that slides under the door and holds onto it from both sides. As I have already mentioned, making a fabric slam guard similar to the Original Cushy Closer is easy. You’ll need two small fabric rectangles, a piece of elastic, and a bit of stuffing. Once again, you can either sew or glue three sides of your fabric rectangles front to front, and then invert them. Just remember to put in the elastic loop on the shorter side of the rectangle before you close it. When you have the makings of a pillow, you can stuff it with cotton or even scraps of fabric. Then put the second loop of elastic on the short side and close it with thread or glue. On the original product, you can see that they also sewed along the edges. If you want to make the pillow more secure, you can do that as well. Otherwise, this DIY is pretty much finished. Making one of the foam slam prevention products I’ve shown you is the easiest project you can think of. You can make it out of your kids’ old foam puzzle pieces or even a small piece of acoustic foam. Even a dishwashing sponge might work if it is large enough. You’ll just cut a 2 or 3-inch circle out of whatever material you end up choosing. Cut off a smaller circle about as wide as your door in the center of the material. Then, cut the donut in one place, widening the incision a bit, but not too much — we’re aiming for that tight “C” shape. After all, it’ll still have to be narrow enough to pinch the door. Hopefully, I’ve managed to shed some light on the types of products you can use to stop your doors from slamming. Although commercial products may be more attractive solutions, you can easily make personalized substitutes. The most important thing is to make sure that whatever you end up installing really works. And, as you’ve seen, any of the devices in this article would fit the bill. Obviously, preventing your doors from slamming shut won’t be enough in some situations. You can also address the source of the draft — which are likely to be your windows. I’ve explained how to soundproof windows in many of my articles. However, if you’re looking for a good place to start, you can check out my guide to soundproofing a room from outside noise. That might address the cause of the problem. However, if your doors are slamming because you have particularly moody kids, soundproofing your windows will do nothing at all. Still, in that case, these protections will just make sure all of their fingers make it through their tantrums.